Ibama Visitor's Center, The Turtle Museum in Fernando de Noronha. 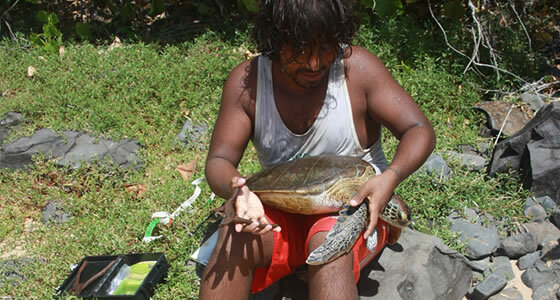 Get to know more about the Ibama Visitor's Center and the Turtle Museum in Fernando de Noronha. The National Centre for Conservation and Sea Turtle Management of Brazil or TAMAR has a visitors` center and an Open Sea Turtle Museum at Alameda do Boldro, which has plenty of information regarding the importance of turtle conservation and habits of turtles, shown via posters, videos and multimedia programs. A café and a small lecture theatre are also housed here, where talks are held by environmentalists or videos shown on subjects related to sea turtles as well as environmental conservation in general. The office also has considerable information on the island’s natural history. It is worthwhile to check with this office when a turtle egg laying or hatching trip is being scheduled, as the experience is one of a kind. TAMAR employs over 300 fishermen and even prior turtle poachers, who work as turtle handlers, patrolling and examining the turtle nesting areas and providing valuable information to the authorities. Further, the organization has initiated several community programs, including education courses and the setting up of public schools and community vegetable gardens. The centre at Fernando de Noronha also organizes various activities, including worldwide organizations, such as the participation of youth in expeditions, research and educational trips around the world and thus is the best place to get information if you are interested in joining such programs. At the visitor’s centre there is a shop selling souvenirs, such as t-shirts, caps and local handicrafts, the proceeds of which contribute to funding TAMAR’s activities. The centre also allows you to sign up for their ‘adopt a turtle’ program, where by paying a fee you symbolically adopt a turtle, can name it and receive a specialized t-shirt that displays your turtle’s name. The money raised goes towards turtle conservation and towards assisting the 350 plus fisherman who are a part of the TAMAR project.